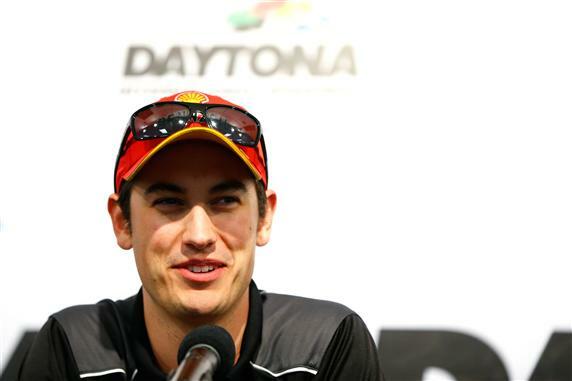 ` Triumphant in last year’s Daytona 500, Joey Logano partook in his signature celebration. He climbed on the door of his yellow and red No. 22 Shell-Pennzoil Ford and ecstatically pumped his steering wheel in the air with his left hand as he was pelted with champagne and confetti following the biggest win of his career. Logano would go on to repeat this ceremonial process five more times in 2015 when he won a NASCAR Sprint Cup Series-best six races. Through seven contests this season, Logano has yet to capture a victory and the automatic Chase berth that comes with it. He maintains his mindset on the track remains unchanged as he heads to Bristol Motor Speedway for Sunday’s Food City 500 (1 p.m. ET on FOX). Although he hasn’t taken a checkered flag yet in his eighth full-time NSCS season, the 25-year-old Connecticut native has produced three top-five and four top-10 finishes. Logano welcomes Bristol where he’s won two of the last three races. Despite his recent success at Bristol, Logano has had his struggles there, including a 40th-place showing last spring when he sustained major damage after colliding with teammate Brad Keselowski early in the race. “Bristol is a beast of its own,” Logano said. “There’s huge banking, short straightaways, you’re in the corners very long. It’s just fast. Every other short track we go to isn’t as fast – Richmond, Martinsville – they’re not as fast as Bristol.